The TheraCane is a deep pressure massage device which can be used to gently massage tender points in the muscles. The user can easily massage any part of the body by using one of the six strategically placed projections. A minimal amount of arm movement and gentle pressure is all that is needed for effective treatment. Each TheraCane comes with a fully illustrated manual. 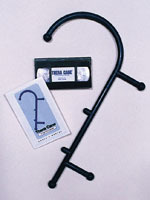 The TheraCane weighs one pound and is made of durable, fiberglass material.